Pack size: 2 x 15ml bottle. Review Total Care Cleaner Great product at a great price - how could you go wrong with Vision Direct when I bought at almost half the price paid normally in Boots. Cleaning contact lenses is a vital aspect of keeping vision pure and effective, but not all cleaners are as effective as each other. It's important to have the most effective cleaner available, and the Total Care Cleaner from vision experts AMO is one of the very best. Don't be plagued by poor vision caused by dirt deposits, proteins and other nasty substances, and ensure a high level of comfort as well with the Total Care Cleaner from AMO. • This cleaner employs the latest in vision research to clean lenses. Using a blend of Miracare 2MCA, Ninol 40-CO and Sipex EST-30, AMO have come up with a superbly efficient and safe solution to dirty lenses. • These substances allow the lens fluid to spread evenly across the lens surface, and provide a non-abrasive way to clean lenses quickly and comprehensively. • All lens wearers need to do is to apply the Total Care Cleaner to lenses and rub for 20 seconds. • Best used in conjunction with AMO's own wetting solution, to ensure that lenses are fully moisturised when worn, for extra comfort. • Particularly effective for wearers of gas permeable lenses. Nobody wants to suffer from foggy lenses or risk infection. 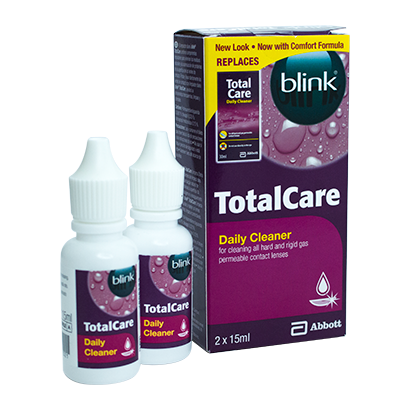 The Total Care Cleaner will prevent any infections and ensure clear vision as well as total convenience.